For the Long Neck Sunrise Rotary Club Community and Youth Service are closely intertwined, although not to the exclusion of other causes and populations. Community Service, the third Avenue of Service, comprises varied efforts that members make, sometimes in conjunction with others, to improve the quality of life of those who live within this club’s locality or municipality. Youth Service, the fifth Avenue of Service, recognizes the positive change implemented by youth and young adults through leadership development activities, involvement in community and international service projects, and exchange programs that enrich and foster world peace and cultural understanding. Long Neck Sunrise Elementary School Dictionary Project for third graders where each child in the third grade receives a dictionary, and the Book Fair project for all students within the school, giving each child the opportunity to select two free books, thereby encouraging literacy and fostering life-long relationships with the children at the school. Oak Orchard Boys and Girls Club’s Major League Baseball Pitch, Hit and Run program where boys and girls from the club participate in a contest where winners can advance to regional and state play. 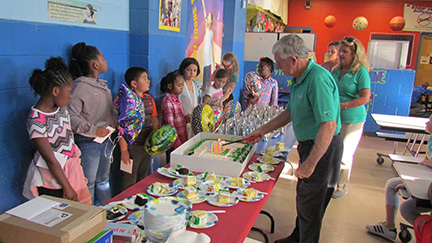 Oak Orchard Boys and Girls Club Celebrating Youth program where children who otherwise may not necessarily ever have a birthday party, are treated to birthday cake, balloons and gift cards to commemorate their special day. Annually enables 3-6 students to attend the Rotary Youth Leadership Awards weekend where they are exposed to many activities design to hone their leadership skills. Providing scholarships to graduating seniors served by the Indian River School District. Ongoing support of our veterans, using the proceeds of our Flags for Heroes annual project to fund donations and special projects. The Youth Services Committee – This committees oversees Scholarships for High School Seniors, Camp RYLA (Rotary Youth Leadership Camp), Rotary Reads (a grant project providing books to the youth at Long Neck Elementary School), Pitch Hit and Run with the Oak Orchard Boys and Girls Club, The Dictionary project, and Oak Orchard Boys and Girls Club Celebrating Youth program. The Fund Raising Committee – This committee is responsible to organize and run those activities so designated by the club to raise funds to support the club’s community service initiatives and Rotary International projects. Currently there are two sub-committees running fund raisers: The Annual Charity Golf Outing Committee and the Flags for Heroes Committee. The Marketing Communications Committee – This Committee is responsible for maintaining the Club website and social media presence, preparing marketing materials to support member recruitment and committee projects and generating press releases related to the work of the Club.